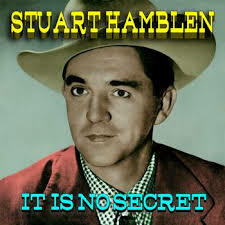 *Back in the 50’s there was a well known radio Host/comedian/song writer in Hollywood named Carl Stuart Hamblen *Who was noted for his drinking, womanizing, partying, etc. One of his bigger hits at the time was “I won’t go hunting with you Jake, but I’ll go chasing women. In order to gather more material for his show, Hamblen showed up at one of the revival meetings. Early in the service the preacher announced, “There is one man in this audience who is a big fake.” There were probably others who thought the same thing, but Hamblen was convinced that he was the one the preacher was talking about (some would call that conviction) but he was having none of that. Still the words continued to haunt him until a couple of nights later he showed up drunk at the preacher’s hotel door around 2AM demanding that the preacher pray for him! But the preacher refused, saying, “This is between you and God and and I’m not going to get in the Middle of it.” But he did invite Stuart in and they talked until about 5 AM at which point Stuart dropped to his knees and with tears, cried out to God. But that is not the end of the story. Stuart quit drinking, quit chasing women, quit everything that was ‘fun’. *Soon he began to lose favor with the Hollywood crowd. He was ultimately fired by the radio station when he refused to accept a beer company as a sponsor. Hard times were upon him. He tried writing a couple of “Christian” songs but the only one that had much success was “This Old House”, written for his friend Rosemary Clooney. By the way… The friend was John Wayne. And the young preacher who refused to pray for Stuart Hamblen? That was Billy Graham. This entry was posted in Just Good Stuff and tagged Billy Graham, Carl Stuart Hamblen, Christian, It Is No Secret, John Wayne, Stuart Hamblen. Bookmark the permalink.